"Life's a laugh and death's a joke it's true. / You'll see it's all a show, / Keep 'em laughing as you go. / Just remember that the last laugh is on you..."
"For life is quite absurd / And death's the final word. / You must always face the curtain with a bow. / Forget about your sin. / Give the audience a grin. / Enjoy it. It's your last chance, anyhow..."
Over at a film odyssey (check out that beautiful logo! ), movie blogger and "Fight Club" opening shots contributor Robert Humanick mashes up two movie mash-ups from YouTube, both set to Eric Idle's uplifting, send-'em-out-whistling curtain number from the great "Monty Python's Life of Brian" (2004): "Always Look on the Bright Side of Life." The first cuts footage from Mike Judge's "Office Space" to the tune, providing encouragement to disheartened cubicle gnomes with martyr complexes the world over. 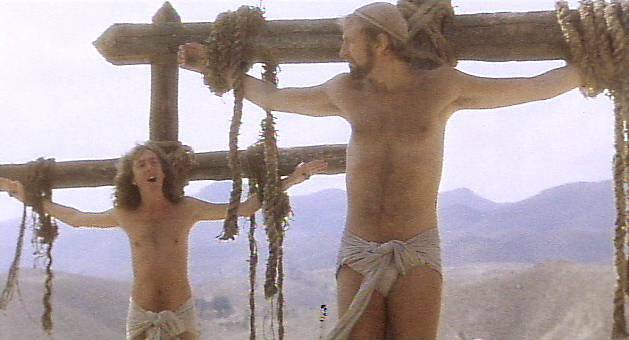 The other uses footage of Idle singing the song in "Life of Brian," intercut with gruesome footage from Mel Gibson's "The Passion of the Christ." Either way, it's a revelation.